Congratulations! The Flag Shop Nova Scotia! 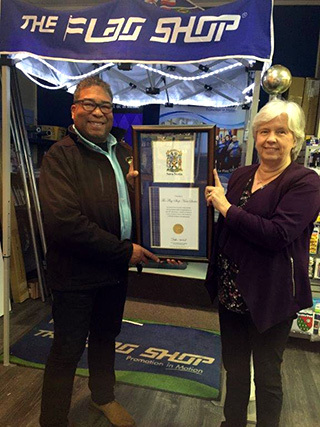 Tony Ince, MLA, for Cole Harbour (shown on the left in the photo) congratulated Debbie Hartlen, owner of The Flag Shop Nova Scotia on behalf of the premier for achieving 25 years of business! The Flag Shop Nova Scotia is located in the convenient central location at 115 Main Street, Dartmouth, Nova Scotia. We are proud to be the leading flag and banner store in Nova Scotia and strive to provide the best products and services to all of our customers. Whether you are looking for banners, windsocks, vinyl signage, national pins, crests and decals, we have them all at The Flag Shop Nova Scotia. Custom banners and flags may be printed or appliqué sewn. We also carry flags of all nations, indoor & outdoor flagpoles, feather flags and all flag and banner related products. Call or email us to get a quote for your project, or you may click on the button below to view The Flag Shop Nova Scotia photo gallery. The Flag Shop is a proud supporter of our Canadian armed forces. Check out our products page.